Il Messaggero are full of transfer news on Wednesday, as they look at the situation regarding the future of Keita Baldé at Lazio and the offers he’s apparently received and rejected. According to the same newspaper a few weeks ago, Liverpool had bid around €20m for the forward, which the club promptly rejected, and now it’s up to their bitter rivals Everton to receive the same treatment, except that the rejection came from the player. 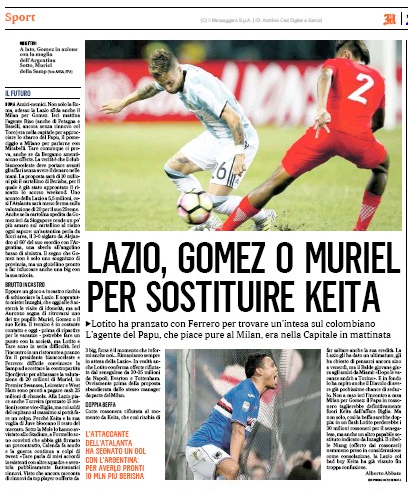 The Italian outlet suggest on Wednesday that the Toffees, who are looking to bolster their frontline as they prepare for Romelu Lukaku’s inevitable departure, had a bid accepted of around €30-35m, only to get turned down by the Senegal international. Piecing everything together, it appears that the 22-year-old is holding out for a move to Juventus, as he looks to stay in Serie A, a league he became one of the stars of towards the end of last season. Baldé ended up scoring 16 goals and picking up six assists in 34 appearances for Lazio last season, yet has refused to sign a new contract with the club as he looks to move up in his career. With Lazio looking to sell at around €30m, and few Italian sides willing to offer that, a move to the Premier League might become his only option. Still, there’s more than two months left of the transfer period, but expect this to be one of the recurring stories.